1. My grandma Freda (my mom’s mom) died before I was born and I am named after her. (In Judaism, you name babies after people who are deceased, as a way of keeping their memory alive.) Anyway, my grandma’s sister, Helen, was very close to my mom, and consequently, was like a grandmother to my sister and me. We’d celebrate holidays together, and every year on our birthdays, Aunt Helen would give us a batch of her homemade mandelbrot (with nuts for my parents, with chocolate chips for my sister and me). When I was 11, we moved out to California and Aunt Helen continued to bake the mandelbrot, shipping it to us across the country. Sure, there were a lot of crumbs, but it was always still delicious. To this day, Aunt Helen still mails us mandelbrot on our birthdays. Of course, this recipe was passed down to my mom, and now, to me. The only difference between their batches and mine is theirs have a lot more burned pieces, although I do believe that’s by choice. 2. Mandelbrot (aka mandelbrodt or mandel bread) is a twice baked cookie made with oil. In Yiddish, mandel means almond (or according to Aunt Helen, nut) and brot means bread. Traditionally, it is made with nuts and sprinkled with cinnamon and sugar. I however, prefer it sans nuts and with chocolate chips. It’s often described as Jewish biscotti but to me, it’s a lot thicker and crumbles quite easily. And there’s no right or wrong time to eat mandelbrot–I’ve been known to have a few pieces for breakfast while other people enjoy dunking it in coffee for dessert. Mix eggs and sugar with a wooden spoon. Add vanilla and mix. Mix the flour, salt, and baking together. Add to the egg mixture, alternating with the oil, four times. Roll into four logs, approximately 1 1/2″ in diameter. Place cookies on their side on cookie sheet and bake 10-15 minutes more. What a great way to honor your family! I’m definitely putting this recipe on my list of “To be baked”. did you know that the chocolate chip was my idea? Aunt Helen told me that a few years ago. Helen said I was watching her and suggested that it would taste really good with chocolate chips and now it’s the best way to eat it. food tastes best when accompanied by fond memories. looks delish! What a lovely family tradition! Looks great! Yum. These look so good. I love family recipes, they just have that little extra love in them that makes them just taste better. What a great recipe and a great story. If it weren’t so late at night I’d be in the kitchen already making these but tomorrow I’m making them and taking them over to babba who will be eternally grateful. I have never made mandelbrot before. We have always bought them at a kosher bakery. Oh and my daughter was named after my own grandmother who never had the chance to meet my daughter. What kind of oil? For some reason when I make these they spread out. Don’t get me wrong, they still are yummy! But I would like to know why mine go flat. Debbie, vegetable oil. Not sure about why yours spread. Did you try this recipe? just made this! they turned out GREAT! i will definitely be making this recipe again. i accidentally poured a little too much oil in, so mine spread a little more than i would have liked, but oh well. also, because i have a chocolate addition, i added an extra 1/2 cup of chocolate chips (making it a total of 1.5 cups of chocolate chips), and would highly recommend this to anyone else who is making these. they were super easy and are so delicious! i will never buy mandelbrot from a store or bakery again! everyone should try it, because once they see how easy it is, i know they will feel the same way. thanks for sharing your family’s recipe!!! Hi Michele. I think it should be OK another night. Enjoy! 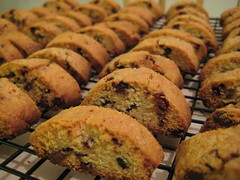 I like to use mini chocolate chips these days when I bake these types of cookies. Thanks for the recipe and ALL your recipes! These look like very nice chocolate chip toasts, but when you deleted the almonds they ceased to be mandlbrodt. The chips also make them sweeter to satisfy kiddie tastes. I was looking for a grown-up tasting traditional almond recipe when yours came up in my online search. I’ll keep looking.